Another TF-51D has taken to the air. Tyson Rininger sat down with the Yelvington family to discuss their new fighter. In this issue Warbird Digest takes a look at how two different artists use their talents for the benefit of the warbird community. Don Ricci’s artwork graces a number of flying warbirds, providing that final touch after a restoration. In our second art focused feature, Ann Lawrence examines Chris Wawro’s unique perspective on restored warbirds. Warbird Digest looks at the final four Thunderbolts recovered from Peru in 1968. 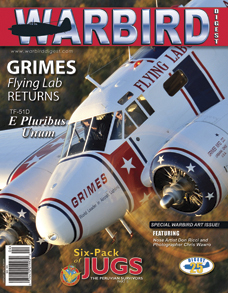 The Grimes C-45 is probably the most unique warbird that we have profiled in the pages of Warbird Digest. Greg Morehead brings the in-depth story of this former working warbird that has returned to its ‘working’ condition by a dedicated team. Doug Fisher brings us another set of shots from his collection of vintage warbirds.